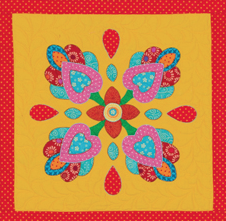 Every couple of years, my small quilt group the Nite Needlers collaborates on a project that we donate as a fundraiser to our guild or another worthy cause. 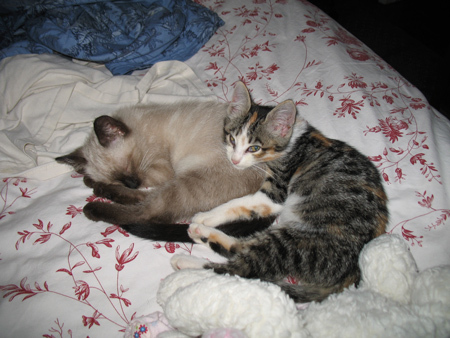 This year we hit on a red-and-white basket quilt. I drafted some basic traditional-looking baskets in my trusty Illustrator program and handed them out with the finished dimensions to all the gals. We’re each making five blocks, and our ground rules are that we’re using turkey-reddish fabrics for the baskets and white-to-cream-with-red for the background. 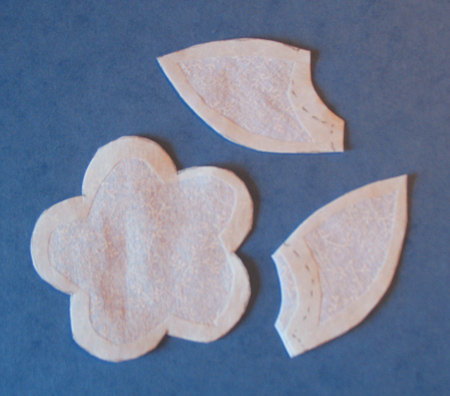 Sticking to the basic basket shape, we can do whatever we like as far as sub-piecing the body, adding appliqué, etc. OF COURSE I had to do some appliqué. Here’s what I came up with. Okay imagine for now that there’s some red print on the white. I had my plan. Now for the execution part. I was presented with some conundrums. IMO, raw-edge appliqué is for decorative purposes, like wall quilts. This project is going to be bed-sized, so I really felt that my appliqué should be turned-edge. “Hand appliqué!” you might be saying. As well you might, knowing me. But there were other factors to consider. 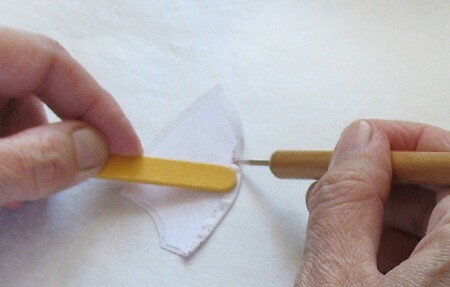 I knew that Janet, who never does anything by hand being the mistress of the machine that she is, would make her handles using turned-edge machine appliqué. 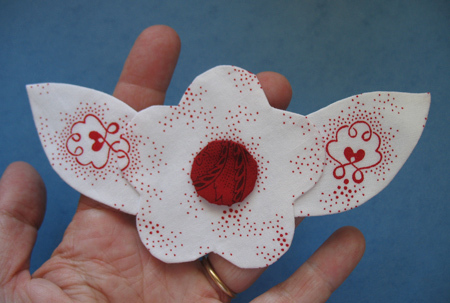 Plus, I wanted to delineate the edges of the appliqué motifs to distinguish between the flower and the leaves a little better, and the machine blanket stitch in the dark red color would work well for that. So there it was. 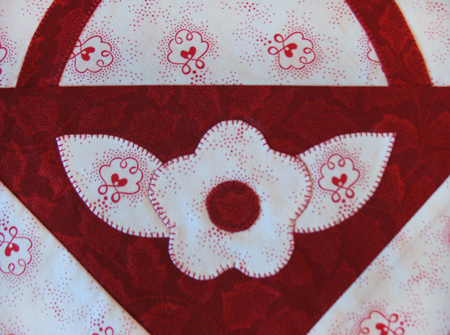 Turned-edge appliqué with a machine blanket stitch. Hmm…. I reached deep into my appliqué bag of tricks, and even ended up inventing a new trick that I threw back in with the rest when I was done! First, the handles. I used Holly Mabutas’ glue-stick turned-edge preparation method, where the turning allowance is glued back onto itself using a freezer-paper template on the front as a guide. All went well. 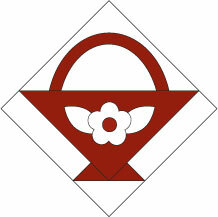 Then the flowers. Another conundrum, factor, wrinkle, challenge, or whatever you consider it to be. These were white flowers on a red background. Can you say “shadow-through?” I wanted to line them. Thinking cap, thinking cap. I could have used faced appliqué, but I was in the glue-stick groove. Got it! A hybrid fusing/glue-stick method! 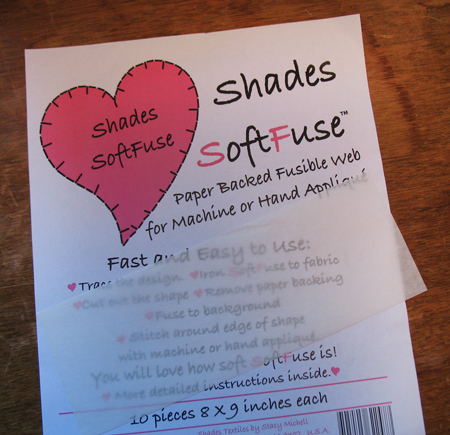 I hauled out scraps of my favorite paper-backed fusible web SoftFuse, and made some templates with the centers cut out. I fused them to some white scrap fabric and cut them out actual size. I removed the paper backing and fused them onto the back of the red-and-white print for the flowers, and cut them out leaving a small turning allowance. Back to Holly’s method, except this time I glued the turning allowance over onto the white lining, using it as my template. It worked! 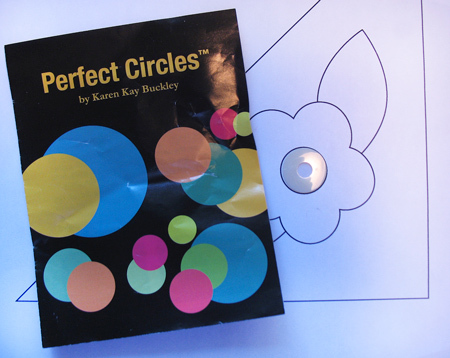 Then I turned to Karen Kay Buckley’s Perfect Circles™ templates to make turned-edge flower centers. 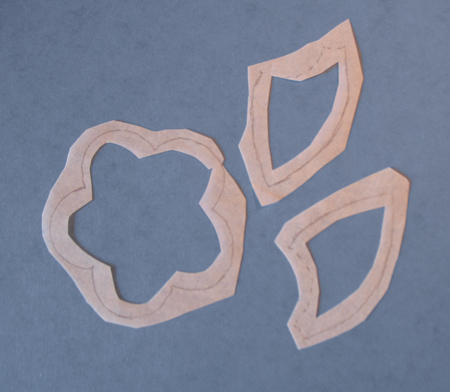 Stick them all together and you’ve got a motif ready to pop onto a basket and stitch. Here are my five baskets, ready to turn in at the next Nite Needlers meeting, and another thing off my list! Thanks Holly and Karen Kay! 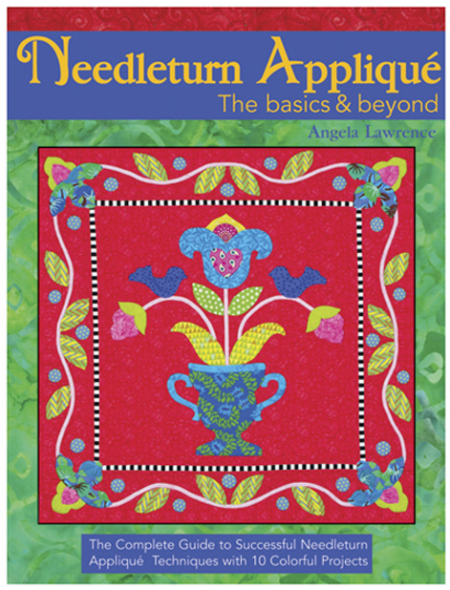 The reader who came up the winner of Needleturn Appliqué: The Basics and Beyond is… No. 63, Judy G.! Congratulations! Judy says that she is very excited, both at receiving the book and because she never wins anything. Now you did! You will find a wealth of information about hand appliqué within the pages of this gorgeous book. Enjoy. Thank you so much to everyone who included nice words about my own books and appliqué instructions. That gave me smiles. For me, August was a time to regroup. I had no shows on my schedule and no major project to be pushing ahead with. I made a list as long as my arm of things to catch up on and get done during this window of opportunity, and I whittled away at it all month. Here are just a few of the more major items on the list. • Reprinted Teapots 2 to Appliqué. Yay, its 4th printing! • Caught up on Show & Tells. If you like teapots, cats, or dolls, be sure to go see the recent spate of lovely projects over at Kay’s Show & Tell Center. 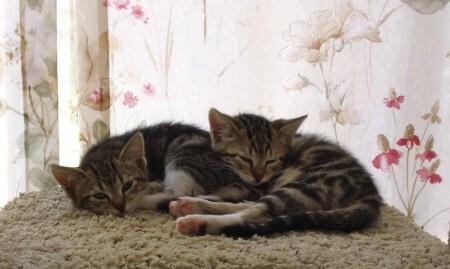 • Sewed curtains for my sewing room, shabby chic ones made from a beloved old floral sheet that doesn’t fit our new bed. According to Dana, Max had “taken down” the old ones. • Made pillowcases out of the leftover sheet fabric using Quiltmaker’s free pillowcase pattern. • Did a major revamp on our back patio. • Printed a bazillion patterns and ordered plenty of stock for upcoming shows. • Prepped about a year’s worth of door prizes. • Updated the Events pages on my website and here on the blog. • Booked hotels for upcoming shows. There are a lot of them. 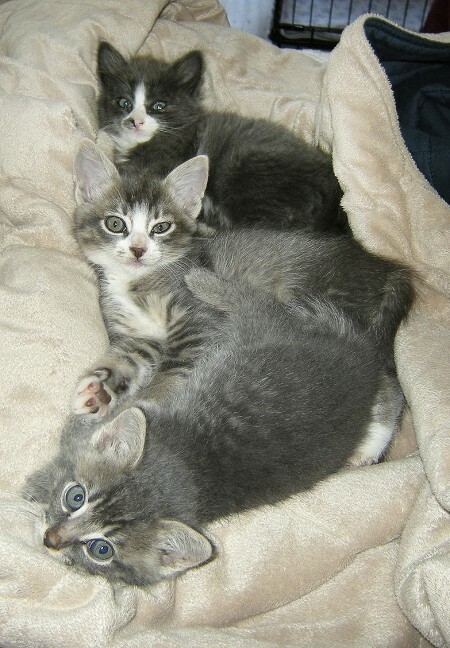 • Played with foster kittens. It was a good thing I had August “off,” because September to early October is going to be a bear. A warm fuzzy bear, but a big old bear just the same. I have shows four weekends in a row. Here’s where I’ll be in the next little while. I had a lovely time last year at this show in historic Sonora, California, and I’m looking forward to my return visit! All the details are at www.sierraquiltguild.com. I’m not even coming home in between, but heading straight up to Portland, Oregon for my first time at this big show. Hope to see you there! All the details are at www.nwquiltingexpo.com. I’ll be home for a few days, then I won’t have far to travel to this show put on by the Peninsula Quilters Guild in San Mateo, California. The guild has lots of fun activities planned, including a kids’ treasure hunt, demonstrations, and raffle basket opportunities. All the details are at www.PeninsulaQuilters.org. Back to southern California! 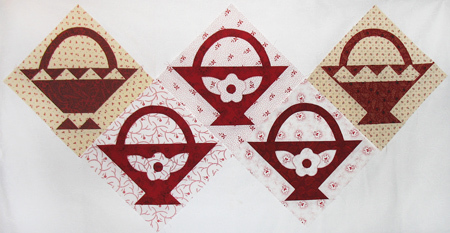 The theme of this year’s show, held in Simi Valley, is “Celebrate.” The guild website is www.simivalleyquiltguild.org.